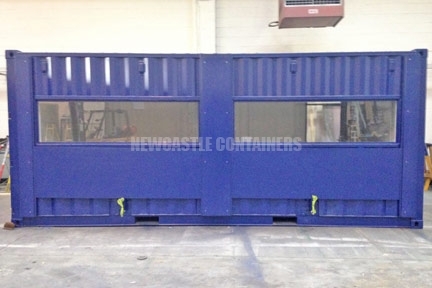 We supplied two 20ft new (once shipped) containers to a company in Newcastle, and converted them into an ordnance explosion viewing platform and testing station. The idea was for them to be moved around the country, to different viewing sites where explosions could be viewed and tested. The units consisted of bespoke explosion proof windows and shutters, insulated weatherproof personnel doors, and a complete internal workshop. As well as these modifications, a staircase was required for access between the containers. It was positioned behind the units and was only allowed to extend from one side of the container, this was to avoid people being in the blast zone. We supplied the staircase and raised it on site. 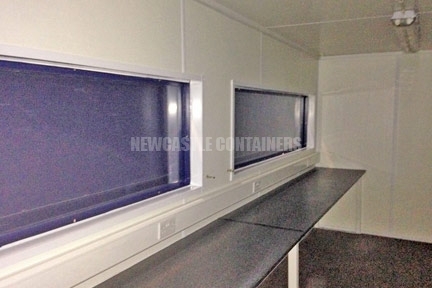 It was a completely bespoke construction, and this was to allow the unit to be disassembled and reassembled with ease. To give the containers a professional external finish, we blew in the paintwork with self-priming specialised container paint. We also supplied a set of double ended twistlocks for stacking purposes.